Home/abou diaby, arsenal, gonzalo higuain, joel campbell, lucasz fabianski, marouane chamakh, nicklas bendtner, park-chu young, ryo miyaichi, tin jedvaj/Arsenal’s Higuain deal hijacked? Ryo not off to Feyenoord, yet! Don’t shoot the messenger. It hasn’t happened yet. But Arsenal’s protracted signing of Gonzalo Higuain could hit the buffers, in my opinion, if a certain other London club come in and offer him better terms. I don’t think Spurs will do that, but Chelsea are certainly capable of it, financially, especially now that they’ve been outbid by PSG for Cavani. We need to get this Higuain deal done a.s.a.p., but Arsenal don’t do ‘asap’, unless the ‘s’ stands for ‘slowly’. Maybe we’re waiting to offload Park, Campbell and Bentdner before we sign Higuain so we can save on wages. Bendtner is inching ever nearer Frankfurt, we hear. He’ll probably be loaned out. Surely one of those ‘six’ interested clubs can put a deal together. Obviously, German clubs are keen to take our players on loan: Djourou’s got a German club for next season as has Coquelin. So while Djourou’s going to Hamburg for the entire season, ‘Coq-au-vin’ will be out in Freiburg. Mannone was quick to get a club, wasn’t he? I wish him the best of luck at Sunderland. Not sure they’ll do well under di Canio, but I think our ex-keeper will do his bit (if given the chance) to help them stay up. Surely, his exit means Cesar’s arrival. It’s been much heralded, but the trumpeters are sick of tooting the same tune! Bring Cesar in, Arsenal! Stop faffing around! Another player we’ve been linked with and lost, it seems is Tin Jedvaj. With a name like that, he’s got to be good…for a laugh. Let’s hope Spurs are not getting the last laugh, if they sign him for £6.5m, as has been reported. They’ve already signed Paulinho, who had a decent Confederations Cup tournament, so might be a good acquisition. One player who wasn’t a good acquisition was Park Ju Young. It looks like Celta Vigo won’t be having our former number 9 back, which isn’t surprising given he went AWOL at the end of last season. He won’t be doing that for 4 weeks, as he’s doing some obligatory military service. If only the South Korean Army would pick up the bill for his wages, we’d be in an even better financial position to sign someone. But no. I have more exits to report . . .
Ryo Miyaichi. Don’t worry, folks! I don’t believe he’s leaving. Not yet, anyway. Wenger’s been waxing lyrical about Ryo’s attitude pre-season. 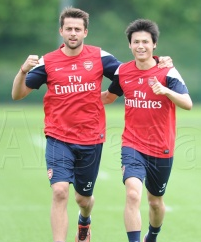 If he impresses in Japan, I reckon we’ll keep him. If he doesn’t, that’s when I’ll take the Feyenoord link seriously. Of course, they want him back, especially as they have a sudden wideman shortage: Boertius has a serious knee injury and Sekou Cisse could be leaving. Nevertheless, Ryo’s not their first-choice replacement for the pair. The Dutch side want Liverpool’s Oussama Assaidi. The problem is the Reds won’t loan Assaidi out, they’d rather do a permanent deal. And that’s where we come in! Well, only if Ryo is up for grabs on loan and right now he’s not! He’s even been pictured on the official Arsenal.com website with Fabianski. So unless we’re flogging the pair, two-for-one, it’s as Hall & Oates would sing: ‘Say No Go’. Meanwhile, that very player, Sonogo has a number 22 shirt to go with his ready-made song. His arrival could mean curtains for Joel Campbell, though. The Costa Rican striker is unlikely to rejoin Real Betis, apparently, so the media are linking him with Crystal Palace and West Ham. The question is how will our London rivals get Campbell a work permit if we couldn’t manage it? I’ll leave the media to ponder that, as clearly they haven’t thought it through. Talking of shirts, Diaby takes the number 24. Finally, a sensible number. Let’s hope he plays more sensibly, and manages to string a few decent games together for a change now. Despite my lack of faith in him, Diaby’s staying at Arsenal, of course unlike Emmanuel Frimpong,who could be on his way to Fulham. Then there’s Gervinho off to Marseilles and Chamakh to Levante. And Wenger to PSG. Next year. I don’t believe it, personally, but Le10Sport are reporting it, so it must be ‘vrai’!